Only 39 Days Until I Start Hiking the PCT! Even though it’s almost been a month since I last updated my blog, it doesn’t mean I’ve been lounging around the pool eating chocolates. I’ve been BUSY preparing for my upcoming PCT thru-hike. Yes, so busy it has to be in ALL CAPS. A lot of you who have been following my journey (mainly in real life and on Instagram) know I’ve been spending the last year+ of my life planning to hike the PCT. It’s been quite a wild ride. I had no idea planning a five month thru-hike would be so intense. There is so much preparation needed when you take five months off of everyday life to go hike, eat and sleep in the woods. Every single aspect of my life has changed in order to make this trip a reality. I don’t know how some people are able to plan a trip like this in a month or even less than six months. More power to them. The planner in me would freak out and probably talk myself out of going. First, I had to figure out my job situation. I mean what job is going to be perfectly okay with me saying peace out for five months? Turns out not many. I’ll technically be unemployed the whole time I’m hiking on the trail. For all of you future cool job prospects, holla at your girl in September to help me get something lined up for my return back into the real world. Then I had to start saving some money. Even though I’m just hiking, eating and sleeping for 150 days, I have to pay for the gear on my back, the food I eat, the milkshakes I drink, the hotels I may/may not get to stay in and my adult expenses while I’m gone like my car, insurance, health insurance, cell phone and cat food for my cat, Ace. For those of you interested, I have a trip registry set up for my PCT adventure where you can be an active part of my hike without taking a single step on the trail. On my registry, you can sponsor things like a shower, meal, gear or even a town stop. It also lists the towns I’ll be stopping in along my hike. A HUGE thank you to the many friends and family who have already sponsored parts of my registry. Look out for postcards and shout outs on social media from me, from the trail! Then there’s the gear research and purchases. With trying to keep my base weight down to 20lbs or less, you’d be surprised at how much the gear costs for an adventure like this. Ultralight = ultra-expensive! There were so many gear purchases made and even a few returns/exchanges. My wallet hurts just thinking about it, but thankfully my REI dividend was big enough this year to buy a couple more items I needed for the trail. I still need to buy my emergency beacon, but I’m waiting for the REI sale at the end of March so I can get 20% off. I also still need to make a few purchases down in San Diego since I can’t fly with a fuel canister for my stove, a lighter, Swiss army knife and more than 3 ounces of Deet. Researching and buying gear isn’t enough. I had to make time to try out the gear on the trail, making sure, 1, I knew how to use it properly, 2. It would work for me on my hike, and 3. It was something I’d really need instead of being deadweight in my pack. I wanted to make sure I set up my tent a few times and slept in it out in the wilderness and didn’t want my first-time boiling water in my JetBoil to be on my PCT hike. You get the drift. And of course, I had to make the time in my schedule to train for my hike. I tried joining a gym, but quickly learned the only way to train for a hike is to hike. Hiking became a third job for me this year, in addition to teaching yoga and bartending. Mondays – Wake up at 6am, hike Mount Si (8 miles roundtrip, about 3,150 feet elevation gain) and then bartend at the restaurant until 11:30pm – on my feet all day long except for the hour drive to and from Mount Si. Tuesdays – Bartend at the restaurant until 3:30pm. Then I might sub a yoga class right after, but then head over to help coach yoga teacher trainees at the studio until 11pm. Wednesdays – My one day off a week! Still, I wake up at the crack of dawn to go hike Mailbox Peak – New Trail (11-12 miles roundtrip, about 4,000 feet elevation gain) usually with my girl. On Wednesday night, we chill with a super yummy late lunch and veg in front of the TV. I enjoy every single second of my Wednesdays. Thursdays – Are always different. Lately, I’ve been covering the lunch shift at work on Thursdays, which means I bartend until 3:30pm. This week I had an hour-long massage and then took a quick nap afterwards. I always teach my hour-long hot yoga class on Thursday nights. Fridays – If I’m not having lunch with my Dad on Fridays, I’m getting acupuncture (once a month.) Now that my Dad has left for Alaska for the season, Friday mornings are now for hiking until I have to get on the road and head back to the city for work. Yesterday, I did a 15-mile hike and then went to bartend for the rest of the night until midnight. I always work Friday nights until midnight. By the time I get home on Friday night, I’m pooped. Saturdays – Early Saturday mornings are either for subbing a hot yoga class or getting another hike in. Saturday nights I bartend at the restaurant until 10pm. Sundays – I teach two one-hour hot yoga classes. I have some time in-between classes where I can either go home and take a nap or go to the farmer’s market for lunch. Then it’s off to bed so I can prepare for my early start on Monday morning. Over the last month, in addition to abiding by this crazy schedule, I’ve also managed to fit in other things like an appointment with my physical therapist once every two weeks to help get my right shoulder healed. It’s working! I’m hiking with less and less pain now and able to add weight to my pack. I also taught a yoga class as an Athleta Influencer at the downtown Seattle REI store for the Athleta launch into REI. That was such a cool experience. I hope I get to do more of those when I come back from my PCT hike. This Thursday, I get to talk about my upcoming PCT thru-hike with high school kids, who are following my adventure in their classroom. How cool is that? Hopefully I’ll get to inspire a few future hikers out of the bunch. Stay tuned. The fun and adventures are just getting started! 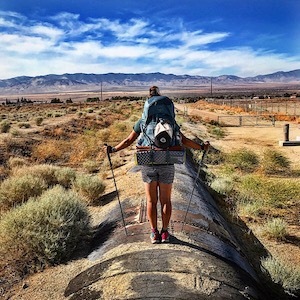 « How Long Will It Take You To Hike The PCT?